But recently we realized that we could do more than just give people a smile—we could actually use these moments as an educational opportunity. A recent study (Berg, 2018) showed that college students exposed to data for less than two seconds actually had greater recall six months later than students who learned that same information over the course of an entire semester. These microlearning moments forge indelible neurological pathways in the brain that accelerate subject-level mastery at an unprecedented pace. Knowing the value of these moments, we set out to build a microlearning engine that allows you to learn while using TeamSnap the way you already do. No enrolling in classes or sitting through lectures—just cutting-edge domain knowledge driven deep into long-term memory while you manage your team, club, league or tournament. 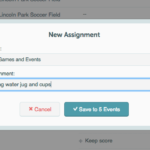 TeamSnap Microlearning is also available in our mobile apps, so you can reinforce your studies at home, at work, or even at the field during the twins’ soccer game. Watch your four-year-olds chase the ball while you chase a degree in applied theoretical mathematics. Organizing your team, club, league or tournament can be time-consuming and expensive. So can going to college. Luckily, thanks to TeamSnap Microlearning, you can simplify your life and pick up an advanced degree as easily as point, click, go! Visit the Microlearning tab in TeamSnap for web, iOS or Android to choose which subjects you’re going to start learning today!